Nearly everyone finds writing hard. Writers find writing hard. What makes writing hard for you? Meanwhile my sentences are orange juice: slightly bitter and pulpy and dully reliable. I’m disappointed with every mundane morning-orange-juice clunker of a sentence I write — every bit of punctuation sitting like a lump in my throat instead of a flowing bit of, say, French — maybe spoken by an equanimous man with a deep, slow, deliberate voice after a drink of, say, olive oil to lubricate the works, perhaps while sitting on the banks of the Arno River — I know it’s not in France, but say he’s on vacation — perhaps while in love. And slightly sleepy. But all I write is orange juice. Maybe orange juice after brushing your teeth, even, if I’m particularly stuck. But at least if all I’m writing is orange juice, what I’m baking is brownies. At least there’s that. Preheat oven to 350°F. Toast coconut for the topping: Spread about 1 cup of coconut flakes out on a baking sheet and bake in the oven 6-8 minutes, stirring every couple of minutes or so, until the coconut is golden brown (keep an eye on it -- it burns quickly). 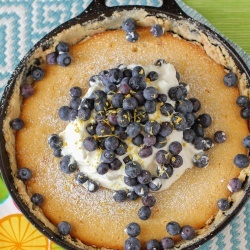 Spread it out on a plate to cool completely. Make brownies: Line an 8 x 8” pan with with a foil sling: tear off 4, 16-inch long pieces of aluminum foil and fold them in half. Situate two side-by-side in the pan, covering the bottom of the pan to the edge (they will overlap). Situate the other two strips in the same manner, but perpendicular to the first. The overhanging foil of the sling will make it easy to remove the brownies from the pan after baking and cooling. Spray foil with cooking spray. Prepare brownie batter according to directions on box. Spread batter in prepared pan and bake according to package directions. Let cool completely. Make coconut cream: Combine the half-and-half, coconut milk, eggs, sugar, cornstarch, and salt in a large saucepan and bring it to a boil over medium-low heat, whisking constantly until it’s thick and bubbling (this can take anywhere from 15-30 minutes. Just do it. It’s worth it. It won't look like it's doing a darn thing until it finally thickens and bubbles, so patience and faith are key). Remove it from the heat and add coconut and vanilla extracts and the 1 1/2 cups of untoasted coconut and stir. Pour this filling over your cooled brownies and set the whole thing in the fridge to chill until firm, about 2 hours. Assemble: Combine the heavy whipping cream and powdered sugar in the bowl of a stand mixer and whip to stiff peaks. 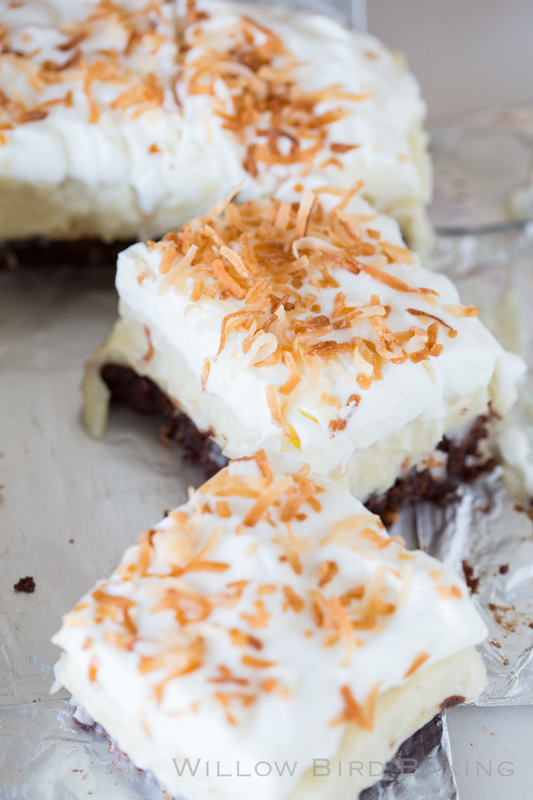 Lift the brownies out of their pan and top with whipped cream and toasted coconut. Cut into squares and serve. Refrigerate any uneaten brownies in an airtight container. I made these today with one of my homemade brownie recipes. It got rave reviews. 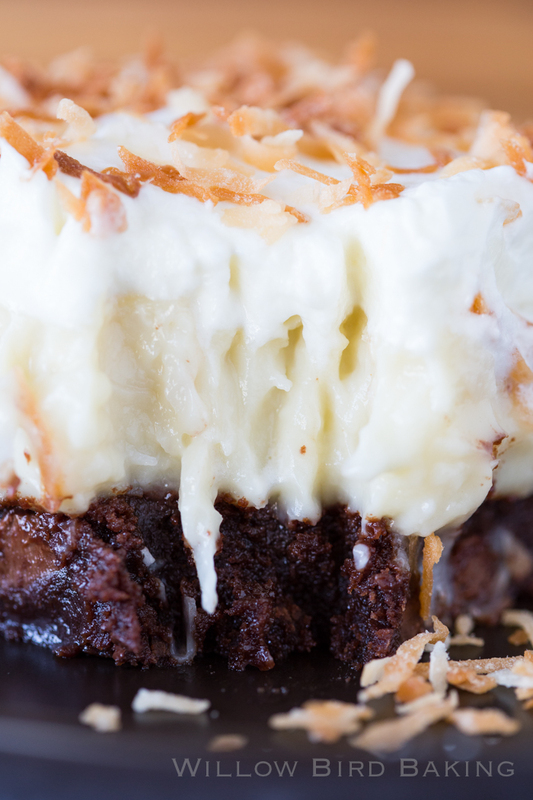 I look forward to eating the extra coconut cream like pudding (the brownies were a deep dish recipe and there wasn’t room for all of it). These brownies look SO delicious, Julie! 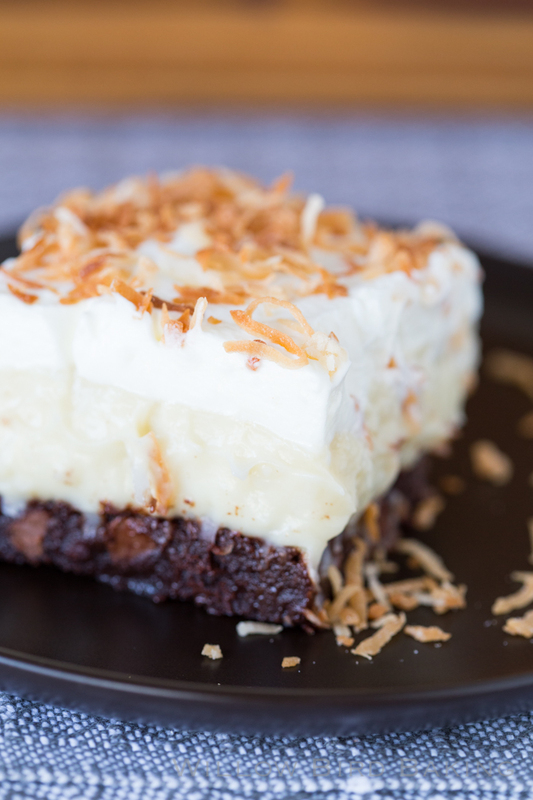 I love coconut, so this is right up my alley! Can’t wait to try them! Did you use canned coconut milk or coconut milk that comes in a carton? 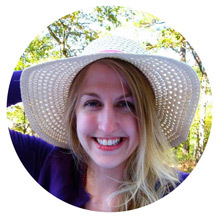 Julie – you are a wonderful writer! Not just orange juice at all. I love your perspective in stories; I usually think I know where you are going to take a story or think I can guess what your point of view will be, but then I’m often wrong (which is good). I read your blog both for the recipes (I’ve made so many of them) and for the stories. I always “click through to keep reading.” Please keep writing! And baking! And writing about baking and life that happens between baking. I love it all and think you are so talented. This is THE recipe I saw that made me come running to find you! I must eat this…like now. Unfortunately I have to go to the store and buy all the stuff; but I WILL be making this soon! Love your site and look forward to following you along on your journey. Aw, thanks Sara! Welcome! I’m glad you’re here and hope you enjoy these — we certainly did! OK – these are ridiculously good. That said, I can’t imagine how you could fit this all into an 8″ pan. I did mine in a 9×13. The brownie was more like a crust (although I kept it moist, the chilling made it firmer). The only thing I doubled was the whipped cream, and, honestly, that was just because I wasn’t paying attention and dumped the whole pint of cream in the bowl and didn’t feel like dealing with it. I wouldn’t necessarily double it again… not that there can really be too much whipped cream. This is a RICH dessert. A little goes a long way. I would cut slices small and let people go back for more. Oh, and I didn’t both with the foil liner. Mine came out of the pan just fine.